I don't have a 'finished' photo of this pizza, and there's a very good reason for it. When I offered to bring supper to her family one Friday Night Pizza Night, I asked Jill to tell me exactly what kind of pizza she liked. I know exactly what I like on a pizza and I wanted to give Jill what she wanted. She said "oh, I love veggies." With no "I hate mushrooms and onions" or "I'm sensitive to gluten" guidelines, I was pretty much free to do whatever I wanted. I figured I'd play a little bit by starting with a spinach crust, but keep it not too crazy extreme. 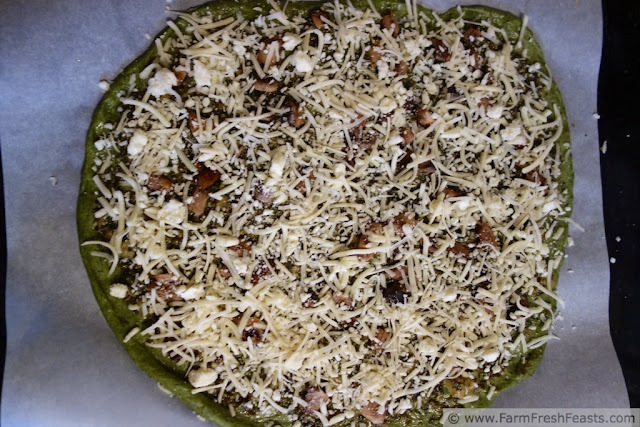 Spinach, feta, pesto, mushroom and artichoke all play well together, so that's what I did. Preheat oven to 450 degrees. If you have a pizza stone, stick it in the oven to preheat as well. If you don't, use a cookie sheet for now, but look around next time you're in a thrift store. If your stone is cracked like mine, just shove the edges together, it still works fine. In a small bowl, smush the roasted garlic clove into the warmed olive oil. In another small bowl, stir the pesto and artichoke antipasto together. Set the small bowls aside. On an oiled piece of parchment paper, stretch out the dough into the shape that appeals to you--or that you think would appeal to Jill. Brush crust with garlic oil. Spread pesto/artichoke blend across crust. Scatter mushrooms across surface of crust. 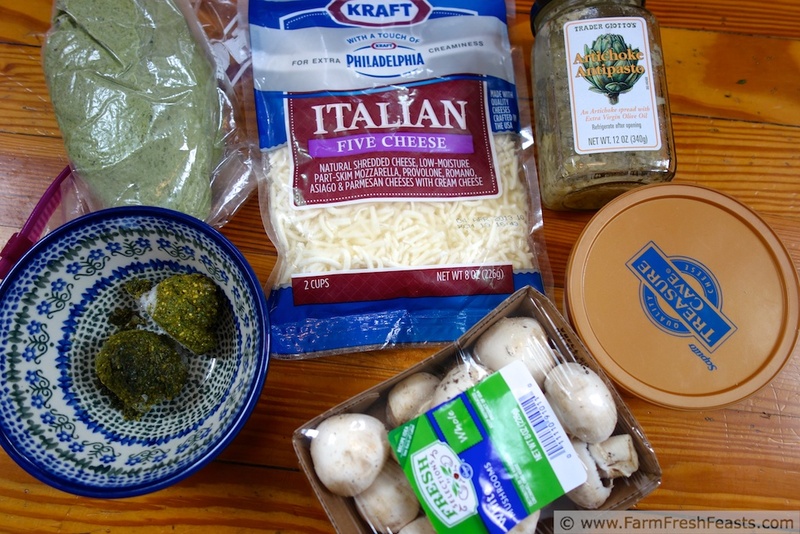 Sprinkle feta crumbles and then shredded cheese across the top of the mushrooms. Sprinkle top with Pasta Sprinkle. Bake for 5 to 8 minutes, then shimmy the crust off the parchment and directly onto the baking stone (or cookie sheet). Continue baking for another 3 to 5 minutes until the cheese is browned and bubbly. If you're taking this to Jill, throw it on a rack to cool while you're heading over. If you're eating this at home, cool on a rack for a few minutes, then slice and serve. This post is shared with the cool kids at the Farm Girl Blog Fest at Let This Mind Be In You, the Clever Chicks Blog Hop at The Chicken Chick, the Wednesday Fresh Foods Link Up at Gastronomical Sovereignty, What's Cookin' Wednesday at Buns In My Oven, What's In The Box at In Her Chucks, and Taste and Tell Thursdays. Hi! I found you through #SundaySupper. I love how healthy this pizza is. It's got all my favorite ingredients! Looks yummy! Not actually eating this particular pizza (since Jill did) I can't tell you it was yummy, but those same ingredients in other combinations were indeed yummy. Who says pizza can't be healthier? Sounds delicious.. Looking for more veggie dishes this spring and summer... and we LOVE pizza here at Dandelion House... I'm your newest follower! I may know veggies, but I really don't know what a follower is. Must figure this one out. I mean, I figured out how to make my visual Recipe Index by Ingredient, so I can figure out following, right? PS.. Please share your farm fresh recipes with the Farmgirl Friday Blog Hop... It's live now so come on by! You'll love it! Now this is my kind of pizza. But not the hubby. He will only eat pepperoni and I mean only pepperoni pizza. He just doesn't know what he is missing. I was thinking of your spouse's pizza preferences when I put some pepperoni on an eggnog-butternut squash crust last night . . . my family ate the whole thing--no leftovers for photo ops! 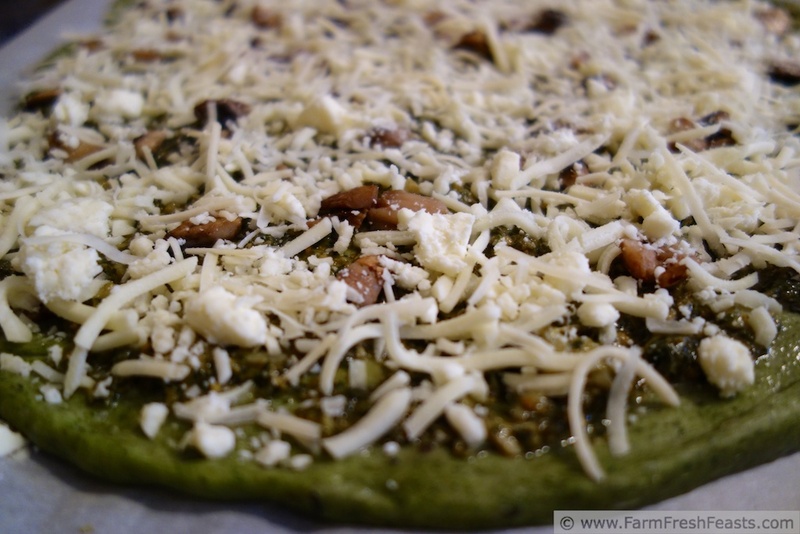 I am loving that spinach pizza dough! I haven't seen that before. Spinach pizza was my gateway vegetable to more . . . colorful vegetable--and fruit--pizza doughs. Stick around, who knows what you'll see next? I just used up the second batch of blueberry-raspberry dough for a goat cheese, sweet onion, and Peppadew pizza, and that was a pretty tasty combo. I love how you included spinach in the pizza dough! We love making our own pizzas at home with everyone adding the toppings of their choice, but we usually stick with traditional dough. Next time, I'm giving yours a try! Slipping a spinach crust under plain old ordinary cheese pizza toppings was one of the first ways I fed my kids spinach when they were little. I love having my kids top their own pizzas--I should do a blog about that. Thanks for the inspiration, and for stopping by! I love the veggie-fied pizza. It's right up my alley, although I'm out of my farm share pesto. I did buy something which resembles pesto in a tube...now that I'm thinking about it, it sounds kind of creepy. Hmmm. I'm sure Jill loved the pizza. I know I would. Matter of fact, if you come to Cleveland, pizza in hand, you have a place to stay. Quite frankly, pesto in a tube sounds far better than anchovies in a tube. By the time my pizza made it up to Cleveland it would be cold. How hot can your oven get? Do you have a stone? I suppose I could let the crust rise while driving . . . I love your green dough! Never ever thought of that before and no idea why not! I'm always scratching my head wondering why I hadn't thought of a great-sounding combo that I see on blogs. And I don't have lice. I'm finding that if the toppings are familiar enough, my family will eat any kind of crust. I mean, beets?! But they loved the roast beef and mozzarella, so they ate it. Please let me know how it turns out if you try it. I hope you do try it--it's pretty and it's tasty and it's not all weird like my beet crust. Which I happen to find pretty and tasty as well, but we all know I'm a little . . . off when it comes to pizza. That pizza looks really good........Thank you for sharing with the Clever Chicks Blog Hop this week; I hope you’ll join us again! I need to try making your spinach dough! If you've got farm share spinach, it's easy to do. The dough keeps in the fridge for several days, just getting more vibrantly colored, and even freezes well too. If you try it, please let me know how it works for you. A few more doughs on the horizon to tempt you! Arugula pesto, sweet potato are the two I've been working with lately. I love that you used spinach in the crust. I typically hide spinach in my kids' smoothies and they don't notice it either. A very healthy addition. I've given up trying to hide things any more. The kids, they are too wily! But they'll drink Kale Lemonade Smoothies, so I'm ok with their wiliness. Sometimes.